The Three Jewels, also rendered as Three Treasures or Triple Gem (Sanskrit: Triratna, also Ratna-traya, Pali: Tiratna, Chinese: 三宝, Sānbǎo, Japanese: Sambō or Sampō) are the three central concepts in Buddhism. — The Buddha (Chn: 佛, Fó, Jpn: Butsu) is the Awakened One. see also The Tathagata and Sakyamuni Buddha. — The Dharma (Chn: 法, Fǎ, Jpn: Hō) is the teachings or law as expounded by the Buddha. 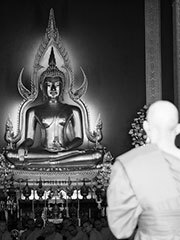 Taking refuge in the Three Jewels is the formal difference between Buddhists and non-Buddhists.Briefly said, it means that one accepts the Buddha as the example of an enlightened teacher, his teachings as the guidebook on the path, and the Sangha as the supporting community who shares the same ideals. A lotus flower within a circle. The Triratna can be found on frieze sculptures at Sanchi as the symbol crowning a flag standard (2nd century BCE), as a symbol of the Buddha installed on the Buddha’s throne (2nd century BCE), as the crowning decorative symbol on the later gates at the stupa in Sanchi (2nd century CE), or, very often on the Buddha footprint (starting from the 1st century CE). The Triratna is also on the 1st century BCE coins of the Kingdom of Kuninda in northern Punjab, surmounting depictions of stupas, on some the coins of the Indo-Parthian king Gondophares, or the coins of some of the Kushan kings such as Vima Kadphises. The triratna symbol is also called nandipada, or «bull’s hoof», by Hindus.